I was a Lofthouse Cookie lover UNTIL I found and tried this recipe . These became my go to treats for all occasions and what inspired me to try taking my kids’ birthday cakes to the next level. I’ve been making and perfecting these cookies for about 5 years. The dough recipe that I use is from Margo on allrecipes.com and the frosting recipe is from P. Oakes on allrecipes.com also. In a large mixing bowl, cream together the butter and sugar until smooth. Beat in egg yolks and eggs, one at a time until thick and fluffy. Add vanilla, mix thoroughly. In a separate bowl, combine flour, baking powder, and salt. Gradually add flour mixture to mixing bowl until all the flour is incorporated. Once all ingredients are combine, place three to four pieces of plastic wrap on counter and divide the dough evenly between them and then wrap. Refrigerate for at least one hour. I have made the dough well ahead of time and thrown it in the freezer until the day before baking them. SO easy and convenient, and as an added bonus #1 is always more than willing to help make the dough! The best part about this recipe is if you have a stand mixer it is a great, throw in and walk away, and just let it whip-it, no harm done just a little extra air and fluffiness, which in a cookie NEVER hurts! BAKING the cookies. Preheat oven to 375 degrees. Pull the dough from the fridge and allow the dough to set out for about 15 minutes prior to baking. If using frozen dough, thaw in refrigerator overnight, then bake. Once the dough is pliable but not too soft, roll dough out onto a floured surface until about 1/4 to 1/2 inch thick. (My thickness really depends on how many cookies I want to make, ideally I prefer the thickness to be right in the middle of these at about 3/8 of an inch.) 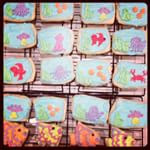 Use a cookie cutter to cut your shapes on place cut-outs on greased cookie sheets about 1 to 2 inches apart. Bake for 8 minutes*. Remove from oven and allow to cool on the pan for 2 minutes. Transfer cookies to a cooling rack to cool completely prior to frosting. *Added note on baking time. This can fluctuate based off the thickness of your cookies and the type of cookie sheet you use. When I had AirBake pans, the length was about 8 mins; but recently switched to a regular cookie sheet and now it’s down to about 6 minutes. In large mixing bowl, cream the butter. Gradually add 1 cup of confectioners’ sugar at a time and a little milk until all the sugar and milk are incorporated. Add vanilla. Beat until light and fluffy about 3 to 5 minutes, another step where you can walk away if you have a stand mixer, the longer the better. Color however suits your fancy. One batch frosts about 5 dozen cookies. 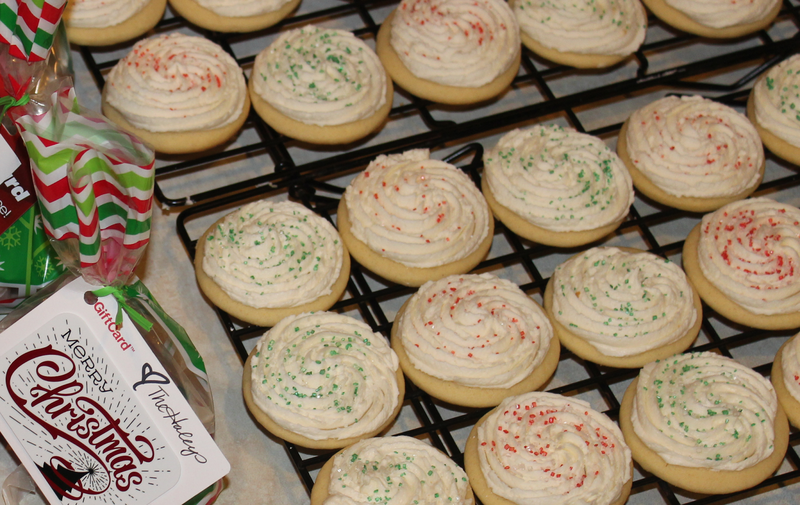 Updated 12/23/15 – I usually make 1.5 batches at a time and there’s enough (with a little leftover) to frosting a whole batch of cookies dough from the above recipe. If you plan on doing detailed decorations on your cookies, I’d have a little back up frosting available for all the different colors. I am still perfecting how to eye the amount of frosting I need to color for a specific detail so we usually just make plenty of frosting to be safe … added bonus who doesn’t like to have extra frosting to like from the bowls! Also, as for the food coloring, I prefer Wilton‘s gel. I know there are lots of choices but I have been please with these and the colors I end up with. Decorating the cookies. Fresh frosting is handsdown the best way to go, whether you spread in on or pipe it on. As for keeps this frosting does do very well out on the counter for upto a week, in the fridge for upto a month, and in the freezer … well I don’t even want to know how long some of my things keep in the freezer  With the amount of sugar that is in the frosting it acts as a natural preservative. 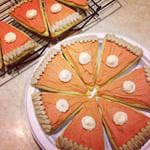 A tip for you plan-a-headers, I have baked fresh dough, frosted, and frozen cookies for later use and they turn out great every time, which means this is a great way have the fun cookie without all the last minute prep! FYI – I use this frosting for ALL of my cakes! As I tried finding as many pictures of the cookies I have done, either I didn’t do a very good job taking pics throughout the years or they are saved on our other computer that has decided it is done working. Really wish I could find a pic of some of the other Christmas cookie designs I have done … SO cute and SIMPLE if I say so myself! Also, I feel the need to put a disclaimer out for #3 and #4, their preschool doesn’t allow homemade treats so they haven’t had the privilege to take these homemade cookies for their birthday.